Economist Gary Becker University of Chicago Archives. In the last 20 years, global health experts have recognized the importance and encouraged the adoption of sin taxes in the fight against non-communicable diseases (NCDs) in the Global South. At the level of discourse, this is illustrated by the vast global health literature on NCDs published from the late 1990s onwards: reports and action plans issued by international organizations like the World Health Organization (WHO) and the World Bank, editorials and scientific papers in medical journals like The Lancet, and policy documents and pamphlets prepared by aid agencies, health charities, and private philanthropies. Most of these documents start by reminding readers that NCDs—chronic diseases such as cancer and diabetes associated with behavioral risk factors like smoking, drinking, and unhealthy diets—are now responsible for most of the burden of death and disability across the Global South. They then identify excise taxes levied on tobacco, alcohol, and sugar as the most effective strategy to address this burden of death and disability. This literature explains how—given that price is correlated with demand for tobacco, alcohol, and sugar—increasing taxes on these products will markedly reduce rates of smoking, drinking, and unhealthy eating and thereby the incidence of chronic diseases associated with these behaviors. It also stresses how sin taxes not only improve the health of nations, but also strengthen their finances. Indeed, as many of the experts cited in this literature make clear, increased taxation rates largely compensate for the decrease in tobacco, alcohol, and sugar consumption, thus allowing national governments to amass larger tax revenues that can be earmarked to finance national health systems and achieve universal health coverage. Last but not least, this literature also extols the fact that, as indirect taxes, sin taxes are relatively easy to set up and administer for governments. 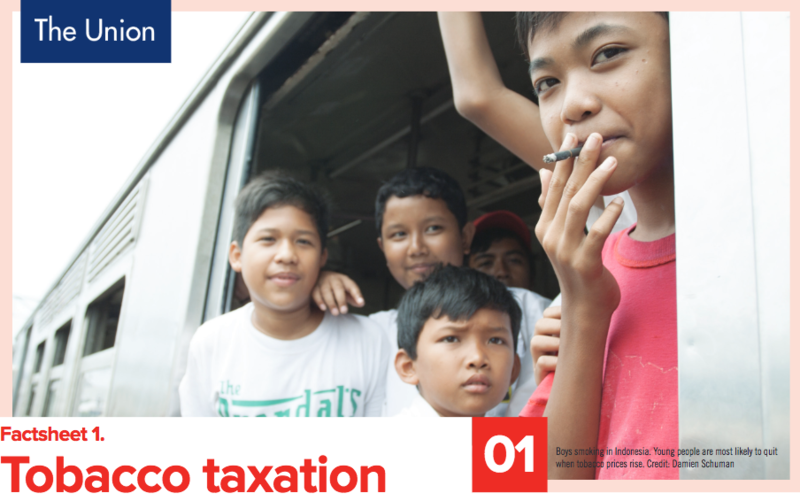 At the level of practice, the growing importance of sin taxes within global health can be illustrated by the mounting number of countries in the Global South—from Chile, Mexico, and South Africa to Thailand, India, and the Philippines—that have introduced taxation schemes for tobacco, alcohol, and/or sugar to combat the NCD epidemic. Many of these national schemas have been supported by international efforts such as the Bloomberg Initiative, a US$1 billion project to reduce tobacco use in developing countries led by the Bloomberg and Gates foundations, in which sin taxes play a central role. Fig.1. 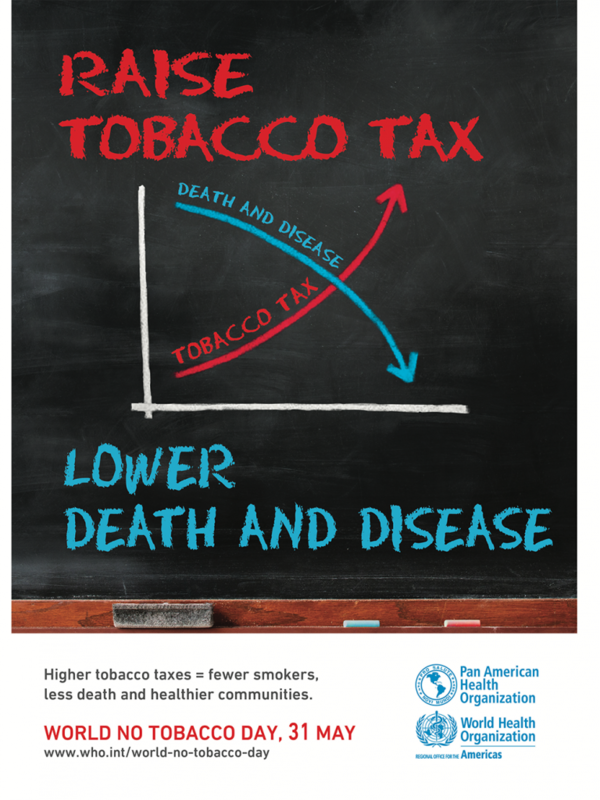 WHO poster for the 2014 World No Tobacco Day advocating for taxes on tobacco products as a strategy to lower the associated burden of death and disease. In many ways, sin taxes are typical of the micro-technologies that have proliferated in the fields of development and humanitarian aid in the past two decades, what Stephen Collier, Peter Redfield, and their colleagues have called “little development devices” and “humanitarian goods” (Collier et al., 2017; Cross, 2013; Redfield, 2012). Indeed, like many of these micro-devices, sin taxes are meant to improve people’s quality of life, are eminently portable, and, as I discuss below, operate at the micro level, targeting individuals’ aspirations, preferences, and calculations rather than any larger macroeconomic aggregate. In this essay I shed some light on the complex genealogies of these micro-technologies by unpacking some of the political theories, scientific concepts, and ethical norms that make up sin taxes. I suggest that sin taxes are built around a particular subject—the rational actor seeking to maximize their welfare in line with their own preferences—whose origins can be traced back to the Chicago School’s microeconomic tradition and its concern with rational choice theory. In doing so, I draw on Madeleine Akrich’s (1992) concept of “de-scription” and her claim that one can find inscribed in a technical device many of the assumptions, aspirations, and values of those who designed it. In my de-scription of sin taxes I examine the work of a small network of economists led by University of Chicago professor Gary Becker and two of his collaborators, Mike Grossman and Frank Chaloupka, that was instrumental in transforming sin taxes into an accepted global health strategy. In particular, I focus on this network’s research on tobacco taxation, which was the first type of sin tax to gain acceptance in the global health field and later served as a model for excises on alcohol and sugar. I begin by showing how this research grew out of Chicago’s microeconomic tradition and Becker’s work in particular before examining how it radically transformed international tobacco control and the model of the smoker that underpins it. I conclude by reflecting on what this story can teach us about the wider history of the recent proliferation of micro-technologies in the fields of development and humanitarian aid. 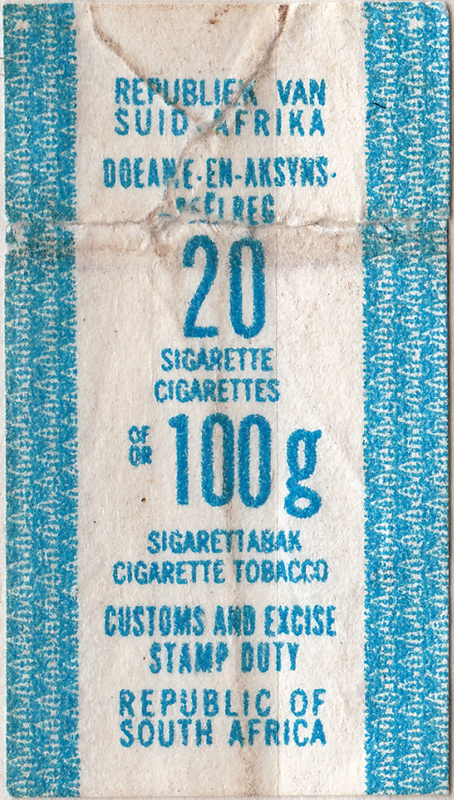 Tax revenue stamp from South Africa. From Andrey Vasiunin’s online collection. The Chicago microeconomic tradition was articulated by George Stigler, Gary Becker, and other members of the Chicago School from the 1950s onwards. As historian Steven Medema (2011:153) has carefully documented, for the earlier generations of Chicago economists, from Frank Knight to Milton Friedman, economics was the study of the “social organization of economic activity” and, in particular, “markets as coordinating devices.” This changed after the 1960s following the arrivals of Stigler and especially Becker at the University of Chicago. For this new generation, economics was redefined as the study of “human behavior” and, specifically, “rational individual choices” under “conditions of scarcity” (Medema 2011:161–162). By redefining their object of study in this way, the new generation of economists at Chicago profoundly altered their discipline (Foucault 2008). First, they made it possible to analyze how individual decisions had implications at the macro level, thus extending economic analysis within its own domain. Second, they encouraged economists to espouse an expansionist agenda and apply their methods to traditionally non-economic domains. As Medema (2011:172) has also showed, the reason for the shift of focus from social organization and markets to individual behavior and choice lies in the marked influence that rational choice theory had on many of the new generation of Chicago economists. Indeed, this “new science of choice,” articulated during the Cold War around the notion of the “rational actor,” was a “catalyst for change” in the American social sciences, where it introduced a fresh focus on and new techniques to analyze the role of individuals and their decisions in the making of complex social phenomena (Amadae 2003:5–8). 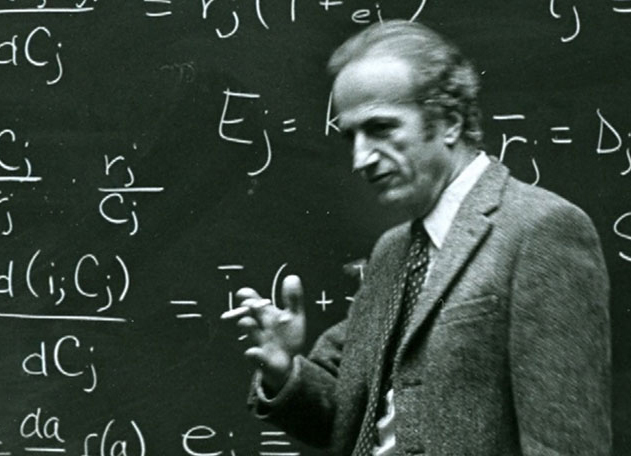 Gary Becker’s work has been central to Chicago’s microeconomic tradition (Medema 2011). Becker established the idea that economics was about the study of human behavior and choice. A disciplinary imperialist, he also believed that economics should not be limited to behaviors usually studied by economists but expanded to behaviors traditionally analyzed by other social scientists such as sociologists and anthropologists. As Becker explained, economics was about “problems of choice,” whether that was “the choice of a car, a marriage mate [or] a religion” (cited in Medema 2001:161). These beliefs strongly influenced the sort of questions (Why do individuals decide to invest in education? Why do they elect to marry and have children? Why do they choose to engage in criminal activity?) that he sought to address in his own research. The way in which Becker approached and analyzed human behavior was informed by rational choice theory. Specifically, he suggested that choices made by individuals should always be considered rational, even when they are criminal or antisocial. By rational, Becker (1992:38) meant that these choices are made by individuals who seek to “maximize welfare as they conceive it.” He believed that when doing so, individuals take into account their own “values and preferences” and anticipate as best they can “the uncertain consequences of their actions” (Becker 1992:38). He also supposed that their choices are “constrained by income, time, imperfect memory, calculating capacities and other limited resources” and shaped by “the available opportunities in the economy and elsewhere” (Becker 1992:38). For Becker, the task of the economist was to develop and empirically test mathematical models that identified and organized these different variables in a way that explained and predicted the type of behavior being analyzed. Not until the 1980–1990s did economists systematically apply the tools and concepts of Chicago microeconomics to the study of smoking (Reubi 2013, 2016). Two interrelated bodies of work were critical in that respect. The first encompassed the studies on the demand for tobacco products carried out by Mike Grossman together with his former student Frank Chaloupka and others (e.g., Chaloupka and Grossman 1996; Lewit et al. 1981). Grossman was key in popularizing the use of Chicago microeconomics to analyze health-related behaviors, both in his own research and as director of the National Bureau of Economic Research’s (NBER) Health Economics Program. For his PhD carried out under Becker’s supervision, Grossman constructed a model of the “demand for good health” where health was a form of “human capital” that everyone possessed and could choose to invest in and increase (Grossman 1972:xiv–vx). Given his interest in health at a time when smoking had become a major public health issue in North America and Europe, it is unsurprising that Grossman subsequently chose to work on the demand for cigarettes together with Chaloupka and other colleagues. This research first established that price was a key factor for the demand for cigarettes. The research also showed that price was a particularly powerful motivator for young adults and individuals of low socioeconomic status, who have less income and are more resistant to public information campaigns on the dangers of smoking. The second body of work encompassed the studies on addiction conducted by Becker in collaboration with Grossman, Chaloupka, and a few others (e.g., Becker and Murphy 1988; Chaloupka 1990). Building on insights from rational choice theory, Becker and his collaborators claimed that contrary to popular belief, “addictions are rational in the sense of involving forward-looking maximization with stable preferences” (Becker and Murphy 1988:675). Using cigarettes and alcohol as their case study, they also built and tested a behavioral model that predicted the demand for addictive substances was greater among individuals who had “low incomes,” were “more present-oriented” and/or had experienced “unhappy” and “stressful events” (Becker and Murphy, 1988:694; Chaloupka 1990:737). Up to this point, two very different intellectual traditions dominated the field of international tobacco control. The first, which stemmed from the field of health education, was built on the notion of knowledge or information (Berridge 2007, chapter 2; Reubi and Berridge 2016). Public health experts working within this tradition assumed that people smoked because they did not know that tobacco was harmful to their health. Following that assumption, experts believed that their main task was to ensure people were informed about the dangers of smoking. This meant educating people about these dangers through warning labels on cigarette packages, school education programs, and, most important, public information campaigns, which were deemed to be the most powerful anti-smoking measure at the time. This also meant shielding people from the tobacco industry’s marketing and public relations efforts through advertising bans and advocacy tactics to monitor and counter the industry. The second tradition, which grew out of developments in psychology and psychopharmacology, was centered on the notion of addiction (Berridge 2007, chapter 9; Brandt 2004). For public health experts and psychologists who came from this tradition, the reason people smoked, or continued to smoke, was their addiction to nicotine, the psychoactive substance in tobacco. Specifically, they contended that nicotine could, by acting on the brain via complex biomolecular pathways, control the behavior of smokers and compel them to continue smoking. For these experts, the main task was to treat this addiction, which they viewed as a pathology, by using smoking cessation techniques such as behavioral and nicotine replacement therapies. Consumers are usually the best judges of how to spend their money…. [They make] rational and informed choices after weighing the costs and benefits of [their actions]…. Smokers clearly perceive benefits from smoking, such as pleasure and the avoidance of withdrawal, and weigh these against the private costs of their choice. Defined this way, the perceived benefits outweigh the perceived costs, otherwise smokers would not pay to smoke. To recapitulate, I showed here how a global health device like sin taxes grew out of Chicago’s microeconomic tradition and, in particular, Becker’s project to redefine economics as a function of individual choice and expand it to non-economic domains. Moreover, I outlined how sin taxes were later decoupled from Becker’s project and redeployed as a key strategy in public health efforts to fight the smoking epidemic in the Global South. This redeployment, I also showed, was accompanied by the introduction of a new model of the smoker—the rational, welfare-maximizing individual—within the international tobacco control field. To conclude, I want to reflect on how this story relates to wider historical accounts about the proliferation of micro-technologies within international development and humanitarian aid. In their writings, Collier, Redfield, and others caution against the familiar and well-rehearsed explanation that this proliferation is the result of a shift from welfare states and the social to markets and the individual (e.g., Collier 2011; Cross, 2013; Redfield 2012). Instead, they suggest that the multiplication of these micro-devices is associated with a rupture in development thought from a macroeconomic concern with large, national physical infrastructure projects to a microeconomic focus on the investments in human capital (Collier et al. 2017; see also Reubi 2016). The story of sin taxes outlined here strongly resonates with this broad historical tableau sketched by Collier and others. To begin with, sin taxes emerge from the reconfiguration of Chicago economics from a macroeconomic discipline concerned with markets as coordinating devices to a microeconomic tradition focused on rational individual behavior. It is worth emphasizing that, in the context of this reconfiguration, markets and individual choices stand in contrast to each other. Indeed, this might come as a surprise to some readers for whom markets and individual choice are necessarily—almost naturally—associated. Furthermore, it is critical to realize that the shift from mass public information campaigns to sin taxes that marked the field of international tobacco control in the late 1990s was not a shift from the social to the individual, but rather a change in the concept of the individual. It was a move away from an individual for whom knowledge always and automatically triggered certain actions to an individual who could decide not to act on knowledge and prioritize other elements such as money and pleasure instead. Last, the strong emphasis placed on individual choice in both Becker’s attempts to reform economic thought and global health efforts to curb smoking should not be interpreted as the death of the social. Indeed, in echo of Collier’s (2011) work on the post-Soviet social, the notion of the social or society has remained important for both projects, albeit in different forms. Thus, for Becker (1997:150), sin taxes are “social taxes” that can protect American “society” from the “social harms” associated with rational addictive behaviors, whereas for global health experts, sin taxes are public health “interventions” that can shield developing “societies” from the health and “socio-economic toll” of “21st-century lifestyles” (WHO 2010:vii, 37). This essay draws on research funded through a Wellcome Trust Society and Ethics Fellowship. The essay also benefited from Stephen Collier and Peter Redfield’s thoughtful comments. Akrich, Madeleine. 1992. “The De-Scription of Technical Objects.” In Shaping Technology/Building Society, edited by W. E. Bijker and J. Law, pp. 205–224. Cambridge, MA: MIT Press. Amadae, S. M. 2003. Rationalizing Capitalist Democracy. Chicago, IL: University of Chicago Press. Becker, Gary. 1992. “The Economic Way of Looking at Life.” In Nobel Lectures, Economics 1991–1995, edited by T. Persson, pp. 38–58. Singapore: World Scientific. ———. 1997. The Economics of Life. New York: McGraw-Hill. Becker, Gary, and Kevin Murphy. 1988. “A Theory of Rational Addiction.” Journal of Political Economy 96(4):675–700. Berridge, Virginia. 2007. Marketing Health. Oxford, UK: Oxford University Press. Brandt, Allan. 2004. “From Nicotine to Nicotrol.” In Altering American Consciousness, edited by S. W. Tracy and C. J. Acker, pp. 383–402. Boston, MA: University of Massachusetts Press. Chaloupka, Frank. 1990. “Rational Addictive Behavior and Cigarette Smoking.” Journal of Political Economy 99(4):722–742. Chaloupka, Frank, and Mike Grossman. 1996. Price, Tobacco Control Policies and Youth Smoking. New York: NBER. Collier, Stephen. 2011. Post-Soviet Social. Princeton, NJ: Princeton University Press. Collier, Stephen, Peter Redfield, Jamie Cross, and Alice Street. 2017. “Little Development Devices/Humanitarian Goods.” Limn 9. Cross, Jamie. 2013. “The 100th Object.” Journal of Material Culture 18(4):367–387. Foucault, Michel. 2008. The Birth of Biopolitics. Basingstoke, UK: Palgrave Macmillan. Grossman, Mike. 1972. The Demand for Health. New York: NBER. Lewit, Eugene, Douglas Coate, and Mike Grossman. 1981. “The Effects of Government Regulation on Teenage Smoking.” Journal of Law and Economics 24:545–569. Medema, Steven. 2011. “Chicago Price Theory and Chicago Law and Economics.” In Building Chicago Economics, edited by R. Van Horn, P. Mirowski, and T. Stapleford, pp. 151–178. Cambridge, UK: Cambridge University Press. Redfield, Peter. 2012. “Bioexpectations.” Public Culture 24(1):157–184. Reubi, David. 2013. “Health Economists, Tobacco Control and International Development.” BioSocieties 8:205–228. ———. 2016. “Of Neoliberalism and Global Health.” Critical Public Health 26(5):481–486. Reubi, David, and Virginia Berridge. 2016. “The Internationalisation of Tobacco Control, 1950–2010.” Medical History 60(4):453–472. World Health Organization (WHO). 2010. Global Status Report on Noncommunicable Diseases. Geneva, Switzerland: WHO. World Bank. 1999. Curbing the Epidemic. Washington, DC: World Bank. © 2019 Limn. The content of this website is licensed under a Creative Commons Attribution-NonCommercial-ShareAlike 4.0 International License. / Designed and coded by American Ethnography’s Information Systems.